Multi Diameter Step Drills produce good quality holes in a wide variety of materials, using either a bench drill or light pedestal drilling machine. Each tool cuts concentric holes in a range of specific sizes. For material up to 1/8” (3mm) thick. 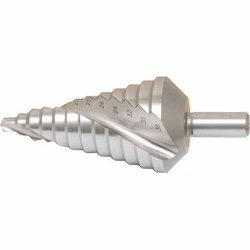 We are engaged in offering a wide range of Solid Carbide Jobber Drills. 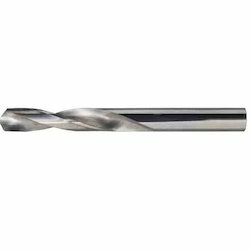 General purpose drills for drilling a wide variety of metallic and non-metallic materials. Point angle: 118°. Tolerance of diameter: h7. Tolerance of shank: h6. supply unit, all diameters - 1 pce. Manufacturing standard: bs 328, din 338. We offer our clients a wide range of Straight Shank Parallel Hand Reamers. These are used to produce a close tolerance surface finish by hand in most any environment i.e. on site or in a workshop. 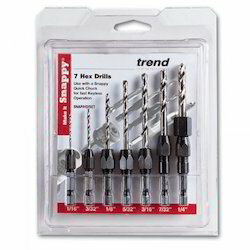 Snap/CS/SET 5PC HSS Snappy drill Countersinks set - countersinks have 1/4" hex shanks with ball retainer recess for use in quick release bit adaptors or 3-jaw chucks. Heat treated tool steel countersink and HSS drill. Adjustable for different length screws and can produce a counter bored hole for standard size wood plugs. The drill produces pilot holes only. 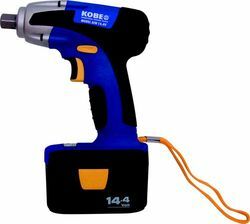 The Kobe AIW14.4V cordless ½” square drive wrench driver is a quality industrial tool. The robust lightweight design incorporates a heavy-duty motor and gearbox; which are capable of handling the most demanding applications. The impact driver is well balanced to provide optimum maneuverability and control over extended periods of use. Whilst the soft grip pistol grip handle sits comfortably in your hand. 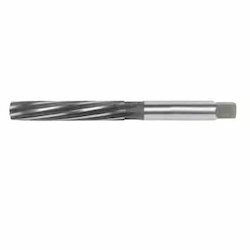 The quick-release 6mm (1/4”) hex bit holder, allows tool bits to be changed rapidly. The variable speed trigger controls the impact speed. Battery status can be checked using the integral battery level indicator. No load speed: 0 - 2,300rpm. Impacts per minute: 0 - 3000ipm. Supplied with: two 14.4V NiMH batteries, one hour fast charger and carry case. 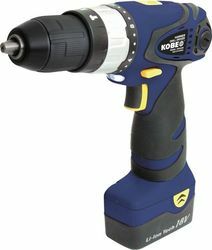 The Kobe DDH180 is a light-weight and well-balanced high performance variable speed reversible combi drill with electric brake. Fast selection of hammer-drill/drill-driver mode is made by rotating the selection collar with 20 stage torque selection for precise screw driving. Supplied complete with carry case: 2x 18v (1.5Ah) Li-ion Batteries, charger and spare carbon brushes. Patented Air-Forced Cooling System (AFCS) design with a cooling fan and heat-extraction vents and robust carry case. Looking for Drilling Tools ?